Inspired by the wealth of the Mayan civilization and its incredible culture, this slot game is a visual feast that will also enable you to win a wonderful jackpot. Mayan Queen is a slot game that features beautiful and ornate Mayan symbols. The game is challenging and offers various opportunities and a high fixed jackpot that both experienced players and newbies can win. Interested in giving Mayan Queen a try? The following review will acquaint you with the most important game rules. The Mayan Queen is the main character and the most important symbol in this game. The Emerald is another symbol to be looking for. Mayan Queen features several other important symbols that are associated to earning – the Mayan Pyramid, Bracelet, Idol, Treasure, Snake, Urn, Dagger, Cheetah and the Portrait. These symbols are less important than the queen and the emerald and they bring smaller earnings. 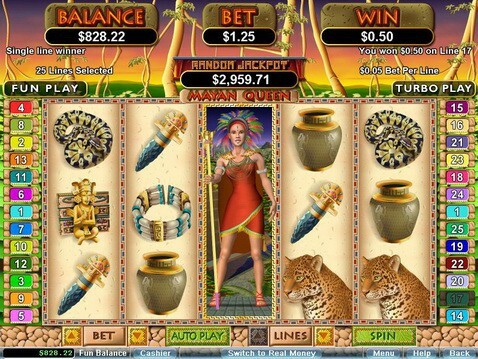 Mayan Queen is a one reel and 25 payline slot game. Convenient up and down arrows are available for players to choose the number of paylines that they want to use. The signs are located next to the Lines button. The Coins denominations vary from 0.01 to 5.00. The Mayan Queen is the wild symbol and it appears only on the third reel. This is an expanding wild symbol that covers all rows of the third reel. Players will see the figure of the queen getting bigger and bigger on the screen, until it reaches full size. Unfortunately, the appearance of the queen is the only animated portion of the game. The expanded wild symbol acts also as a scatter symbol. While the Mayan Queen symbol doubles all payouts and acts as a multiplier, line payouts are not available. The Emerald represents the scatter symbol. Having two or more scatter symbols anywhere on the reel gives the player access to the scatter payout. Five scatter symbols deliver earnings of 500 coins multiplied by the total bet. The free spin round is activated if thee or more Emerald symbols appear simultaneously. During the free round, the background changes from day to night. The Mayan Queen appears again as an expanded symbol that covers the third reel and doubles the payouts. Six spins are available in the free round and they can be retriggered. Mayan Queen is mostly popular because of the large fixed jackpot – 15,000 coins. The jackpot is awarded when five Pyramid symbols appear on a single payline. The appearance of the Mayan Queen will double the payout and make the total 30,000 coins. There’s a second fixed jackpot, as well, and its size is 2,500 coins. The randomly triggered progressive jackpot is another unique and exciting Mayan Queen feature. It can be won during any spin, regardless of the bet size. Players with bigger wagers have a much better chance of winning the progressive jackpot.